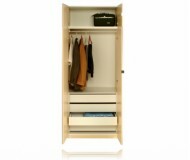 Dimensions:16 1/2W x 21 3/4D x 77 4/25H in. 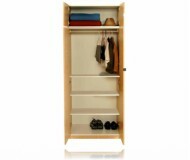 Design for room that require additional storage space but unable to fit 2 full-size closets. 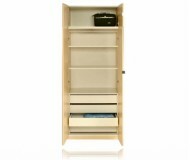 Behind it single door (left-hinged), is a shelf with hang rod and 3 Interior drawers perfect for your foldable clothes such as pants and T-shirts. 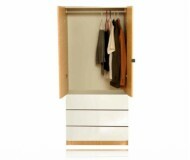 It provides great additional hanging and storage space to nize and store your clothes or TV & media collections in this elegant armoire. 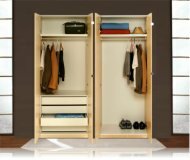 With your choice of case finishes and available in both lacquer and mirror fronts, it's easy to match this wardrobe armoire with any dacor. Create virtually unlimited customize interior configurations by placing addition units side by side for seamless integration and additional storage area.